Shuckle has features that can be teched into any deck due to its single Colorless attack cost of two of its attacks. Not only that, it does act like a wall under certain circumstances. That is because of its Protective Shell Ability, which takes no damage from Pokémon with two or less energy attached to it. There are two sides of the coin: you’ve got Pokémon that excels at doing damage for less energy and others already having three or more energy costs. For the former, Shuckle gives them problems while the latter doesn’t care about the ability. It’ll be a matter of time until your opponent shuts down Protective Shell with either Alolan Muk or Glaceon-GX (and in Expanded’s case, Garbodor’s Garbotoxin). What else it can do besides being a potential wall? It has Triple Poison and Wrap, both cost a single Colorless Energy. Triple Poison poisons the Defending Pokemon and puts three damage counters instead of one between turns. This attack can benefit with Virbank City Gym in Expanded to put 5 damage counters instead of three between turns. If the Defending Pokémon doesn’t switch out, then damage will keep on inflicting! More often than not, there are several switching related cards that will help get the Defending Pokemon out from a tight spot. Even then, the damage that happened between turns is still there. Wrap has been branded with a GX attack that does 40 damage and paralyzes the Defending Pokemon. This is another soft lock since there are ways out of paralysis. If they don’t, then your Pokémon is safe for one turn. This is not something to use unless it’s the only GX attack you have in your deck. Overall, it is a Pokemon that can give you grief if you’re unprepared, but if you have an answer, then it’s not hard to deal with. Shuckle GX (LOT 17) waddles its way into the Pokemon Trading Card Game from the Lost Thunder expansion set. This 170 HP Basic Grass Pokemon has an ability that has raised the eyebrows of many players and sent their theorymoning into overdrive about this card. Protective Shell prevents all damage (but not effects though) of any attack from a Pokemon that has two energy or less attached to it. IMO all I have to do is say “Malamar” and all theorymon on this Pokemon should stop right there, but seven of the top 68 decks ran it at Roanoke, and four of the top 64 at Sao Paolo carried at least one copy. One of the decks at Roanoke played two and another even had three, and one of the four in Sao Paolo had two copies. And all Zoroark has to do is run a copy of Alolan Muk SUM and Shuckle becomes yuckle. I’ve gone 3 W 3 L against Shuckle GX, and all three losses were when I was playing Lost March decks. So Shuckle GX can potentially be good against single attachment archetypes like Granbull LOT or Sceptile CES or Alolan Exeggutor FLI. Unfortunately, there are so many more decks that will just chuckle when they see Shuckle. Shuckle GX does of course have two attacks. Triple Poison, for a single Colorless energy, poisons your opponent’s active Pokemon and puts three damage counters on instead of one, and Wrap GX does a whopping forty damage but does paralyze your opponent’s active Pokemon. I remember some people in pre-release reviews trying to sell these attacks as not bad or even decent. I’m not buying it. These attacks are terrible and among the WORST GX attacks ever. They could easily have had it done five damage counters instead of three or paralysis and one hundred damage. Or even this: paralysis that doesn’t fall off after the next turn. THAT would have made Shuckle much more interesting. As it is, Shuckle GX is a pass for me, and don’t be surprised when its stall ability disappoints you and leaves you regretting your decision to include it as one of your sixty cards. Today we look at a card I love to hate and hate to love: Shuckle-GX (SM – Lost Thunder 17/214, 195/214, 215/214). This is a Basic [G] Type Pokémon-GX with 170 HP, [R] Weakness, no Resistance, Retreat Cost [C], the Ability “Protective Shell”, the attack “Triple Poison”, and the GX-attack “Wrap-GX”. 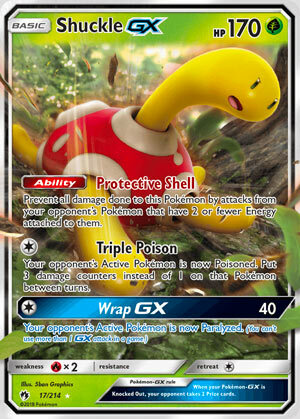 Protective Shell prevents all damage done to Shuckle-GX by attacks from your opponent’s Pokémon with less than three Energy attached. Triple Poison costs [C], and as the name implies, it Poisons the opponent’s Active but you place three damage counters instead of one. Wrap-GX also costs [C] and does 40 damage plus inflicts guaranteed Paralysis. Being a Poké-GX opens Shuckle-GX up to some potent counters and means it gives up an extra Prize when KO’d, but is why it can have the HP and effects it does. Being a Basic makes this easy to run, easy to field, even allows it to be your opening Active. Being a [G] Type means it can tap [G] support – like Net Ball – and has a decent chance of exploiting Weakness and never has to worry about Resistance when using its GX-attack (probably not relevant). Also largely irrelevant is that there are anti-[G] effects but none particularly worthwhile, barring Parallel City so long as you don’t mind capping your own Bench at three Pokémon just to drop its damage by 20. 170 HP is on the smaller side of typical for a Basic Pokémon-GX, and the Ability makes it seem much larger if you cannot get around it. [R] Weakness is potentially bad with Blacephalon-GX doing well, but this is somewhat mitigated by the Ability; [R] attackers with enough Energy to bypass Protective Shell are likely hitting hard enough to OHKO Shuckle-GX regardless of Weakness. Lack of Resistance is negligible for the same reason. The Retreat Cost of [C] is good and comes in handy when you need to get Shuckle-GX out of the way. Protective Shell is great; though an Alolan Muk or Glaceon-GX can shut it down, most competitive attackers require only one or two Energy. I’ll explain why I kind of hate once we start talking combos and decks. Both Triple Poison and Wrap-GX have almost minimal costs – only free attacks are cheaper! For just [C], Triple Poison’s… erm… triple poison is a solid return for this amount and works quite well on something with built-in protection. This is the same reason Wrap-GX is actually a solid GX-attack; 40 for a single Energy of any Type with guaranteed Paralysis might be broken as a regular attack BUT as a GX-attack it actually is a bit underwhelming. That is until you consider the total package; it can help strand something triple poisoned up front, and also shift the “turn count” for when it is KO’d. So, why do I have a mad on for this card? Originally, I was looking forward to it, but then I started slamming into it not just as a temporary wall, but in a Stall/Control deck. Yuck I hate, hate, hate it when the game’s designers basically say “Hurry up and wait to lose!” if I try to enjoy the game the way the rest of the metagame requires it to be competitively played. There are counters to this; as stated, Glaceon-GX and Alolan Muk can shut it down, and some decks can attach enough Energy to their main attacker to do the job as well… but a lot of decks cannot, especially when Shuckle-GX is more than just TecH. As I said, Stall/Control and that means it spams Energy removing cards. Patiently building up something on your Bench to finally hurt Shuckle-GX? Say hello to Crushing Hammer, Enhanced Hammer, and/or Plumeria. It is somewhat bittersweet, but we finally get a deck where Lusamine does what I expected her to do when I ranked her my third place pick of SM – Crimson Invasion. You think you might get lucky and counter Shuckle-GX with Shrine of Punishment but even if your opponent doesn’t just use a Max Potion, they can just spam their own Stadium over and over again while recycling it and Lusamine with a second Lusamine. The same trick works so that you can be hit by a Plumeria every other turn. Most Standard Format decks can be reworked to include an answer, or else already have one. Some of what feels like the most dynamic and creative right now, decks like those built around Granbull (SM – Lost Thunder 138/214) or Alolan Exeggutor (SM – Forbidden Light 2/131), really suffer in trying, which frustrates me. Guess I’ll squeeze in a copy of Oranguru (SM – Ultra Prism 114/156) and see if I can out-stall the stall deck. I’m still uncertain if I’m actually encountering pure Shuckle-GX stall decks on the PTCGO, or if they are actually Zoroark Control decks featuring a Shuckle-GX. Based on tournament results, it can go either way. There are actually a few other decks slipping it in as well, such as more general stall. None of the decks utilizing Shuckle-GX managed a Top 8 finish at any of the last few major tournaments, but a few weeks ago at the Sao Paulo International Championship, the 17th place Zoroark Control deck included one. Another sign that Protective Shell either isn’t as hard to get around as I thought or that the rock-paper-scissors nature of the game has moved on already. I urge caution when considering Shuckle-GX in the Standard Format. If you’re running a deck that has nothing to fear from it and you face a pure Shuckle-GX control deck, great. I don’t think those are too common, however. Instead, you’re probably facing something that has multiple options for stalling you out, and Shuckle-GX is just one of them. For the Expanded Format, Shuckle-GX joins the list of Ability-based walls, which aren’t as easy to counter now that Hex Maniac is banned, but we do have Silent Lab for decks which can afford both a Stadium and deck slot. Shuckle-GX is definitely worth running in the Limited Format but resist the tempting +39 build. Simply put, Triple Poison and one use of Wrap-GX aren’t going to stop your opponent from building up something on his or her Bench to punch through Protective Shell. It probably won’t be a OHKO but you cannot both Poison and Paralyze in the exact same turn, so they’ll probably get enough swings in to take Shuckle-GX down before you can slowly take four Prizes. Yes, I let my personal feelings not just show in this review, but take center stage. In the end, though, I think I’ve given a pretty solid analysis of the card; I hate it for ruining some of my current, preferred decks, but based on tournament results it wouldn’t be as much of a problem if I shifted to a different deck. I do like how, when it comes to Shuckle-GX’s card design, several elements that would seem barely adequate come together into a much better whole.